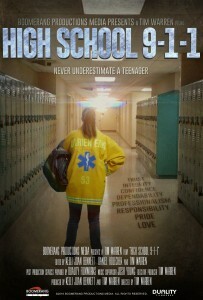 Once you have gotten up off the floor after falling off your chair in shock that I seem to be saying my documentary film—yes, the one I’ve been talking (crying, blogging, bitching, raving) about working on for the last nine years—High School 9-1-1 is not only finished but actually premiering at a film festival…JOIN ME!!!! I am thrilled to announce that we’ll be premiering the film at the 25th annual Heartland Film Festival in Indianapolis, Indiana on October 21st. It’s truly a beautiful festival spreading inspiration and showing films that do more than entertain. So, please join me as I begin to share the film, and spread it’s vitally important and inspirational message of empowering young people through adult mentorship and responsibility, with the world. Yes, that’s right. I plan to share it with the world. My goal is to get every tween and teenager on the planet to see it and blow their minds by showing them what they are actually capable of when given the opportunity and guidance by the adults in their lives. I am so incredibly thankful for you and I deeply appreciate your belief in me, your continued love and support and, your patience. It has been a long road to complete this passion project but I am happy to say that “the baby” has finally arrived. It just took 9 years instead of 9 months. 1. COME TO THE FILM FESTIVAL! The film’s screening dates, times and locations at the Heartland Film Festival in Indianapolis, Indiana in October are up on the website under SCREENINGS. Let me know if you can make any of them. I’d love to have you with me! Please visit the film’s website and sign-up to receive the newsletter which will keep you updated on all the latest news, announcements and future screenings of the film where you can meet up with me and see the film. 3. WATCH TRAILER and SHARE! Please watch the trailer and share it with your friends, your family, to your email lists, in your blogs, in your newsletters and on all your social media outlets. Help me go viral! Tell everyone you know about the film! Like and Follow our social media pages and then post, tweet, tumbl, blog, and comment to share your voice and join the conversation. 5. SEND US YOUR REACTION! I hope to hear from you, see you, connect with you on social media and have you join me in bringing this film to an audience. THANK YOU. Until tomorrow, create from what you have…long gestations. ABOUT HEARTLAND FILM FESTIVAL: Heartland Film is a nonprofit arts organization founded in 1991 with the mission to inspire filmmakers and audiences through the transformative power of film. Heartland Film is a curator and supporter of purposeful filmmaking, honoring a wide variety of cinema and awarding storytellers from all over the world. The films we select and exhibit – whether they inspire and uplift, educate and inform, or have the ability to shift audiences’ perspectives on the world – all have one thing in common: they are entertaining films that do more than just entertain. This is beyond exciting!!! Congratulations on your beautiful film and on the first of MANY well deserved recognitions. Bravo! Fantastic!! How exciting for you and Tim! Congratulations!! !